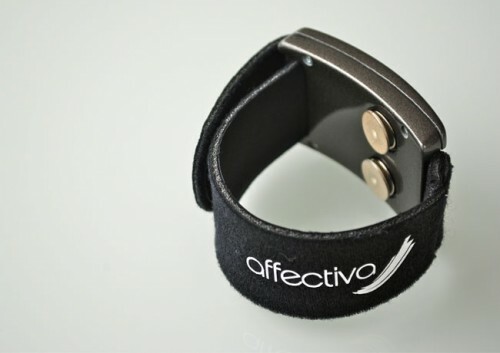 Q-Sensor Bracelet Can Tell Your Mood, And Tweet About It | OhGizmo! By David Ponce on 12/05/11 • Leave a comment! You may just be old enough to remember the “mood ring” fad of the 80s and 90s. Yes, this editor had one and yes, they were junk. But Affectiva’s Q-Sensor 2.0 is in another mood-sensing ballpark altogether. On the underside of the device is a pair of sensors measuring the galvanic skin response, which is an indicator of physiological or psychological arousal. The device just measures your skin’s electrical conductance, which varies with changing levels of moisture. Since the sympathetic nervous system controls sweat glands, it gives insight into whether you’re stressed/excited or not. Galvanic skin response sensors are one component of polygraph tests and have been in use for quite some time. The Q-Sensor 2.0 also measures temperature and movement, puts all the data together into its software and determines your mood. And yes, it can then Tweet about it if you want. The thing is, the device costs $2,000. That’s a lot of cash for personal use. It is being marketed for professional use, where there might be an advantage in accurately determining a person’s mood.